VMware has ousted founder and CEO Diane Greene. Man. THAT must hurt! To be bounced from the company that you created! That is why I like being a sole proprietorship! 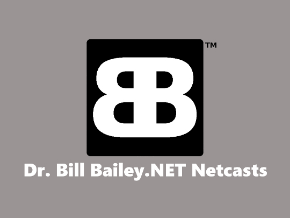 Dr. Bill Bailey.NET is me, and I am Dr. Bill Bailey.NET… ain’t nobody bouncing me out! Not that anyone is interested in doing so! Geek Software of the Week: TimeLeft! TimeLeft is a very handy little utility. I found it while looking for a very specific solution to a silly problem. I have a little “apartment” style refrigerator in my office at work… and it doesn’t exactly cool that well… I call it my “Al Gore” refrigerator… it uses so little energy, it doesn’t even cool! Anyway, I like my drinks REALLY cold! So, I wanted to put my Diet Dr. Pepper in the freezer of the large refrigerator in our break room at work… but you don’t want to leave it is there TOO long! So, I needed a timer that would pop up on my computer and fuss at me to get my drink! Weird problem, huh? Anyway, this little freeware utility does the trick! TimeLeft reminder can alarm you at a specific moment of time or run periodically. It can also remind you before a specified event or keep on reminding after it. Reminder can show a message, play music or open a link/document, execute an application or shutdown your PC. Numerous other options are also available. Clock displays time in different time zones. You can also set a time display format: 12 hours, military, show date, etc. Also you can replace standard Windows clock with TimeLeft clock. Stopwatch measures interval of time. By default stopwatch measures time interval in hours, minutes and seconds. Another TimeLeft feature is sticker – you can place an important note on your desktop. No need to stick around Post-it papers – you can organize all your notes with TimeLeft stickers. Buying or selling anything online? You can easily watch and manage your online auctions (eBay and any other) using auction watch module. You can place your countdown to a web-page using Export to Web module. Let all your visitors know how much time left till your special occasion! 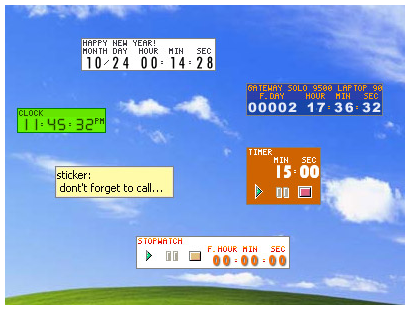 Every instance of a countdown, clock, stopwatch, timer or sticker is a separate floating window, it can be placed anywhere on your desktop. You can make every floating window look just how you want it to look: change layout, color, font or select a Winamp skin; set semitransparent, choose size and more. And, in the process, from my perspective, it also fixed Mozilla Firefox support for the “LinkScanner” feature. 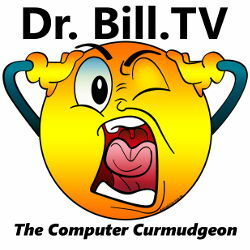 Dr. Bill salutes the 4th of July! Tech News! Geek Software of the Week: IcoFX, No Geek Culture! (What?!?) And, some news on a site feature… lot’s of random stuff! 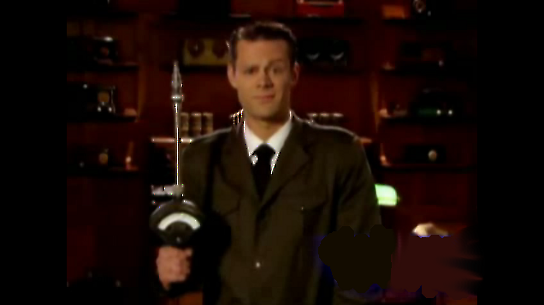 Dr. Bill introduces you to his new favorite odd TV show – The Middleman! It is SO odd! Something we already knew, of course, but it is nice to be validated! Firefox ranks as the safest browser to use to be safe on the Internet, while Internet Explorer is the riskiest browser to use. This is why I install it first when I build a new system. 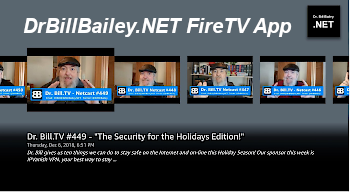 Go forth and be safe! Ubuntu 8.04-1 covers all the bug fix releases since 8.04 came out, and includes the new Firefox 3.0. Obviously, if you have been updating since installing 8.04, you are OK… but if you haven’t installed yet, get this new ISO. Vista reliability will be addressed in the patch that is coming out on this coming Patch Tuesday. Geek Software of the Week: IcoFX! This week’s GSotW is awesome! Now you can capture images, or parts of images as icons for your desktop, edit, color, tweak, to your heart’s content! And, it is all FREE! Competitor Xandros Linux is buying Linspire Linux! Wow! This is pretty amazing! This week Xandros Inc. is buying Linspire. Xandros has done more than any company to put Linux in front of users by powering the innovative eee PC so I’m excited to see the Linspire, Freespire and CNR technology go to a worthy competitor. Linux is going through some healthy and necessary consolidation which will give resulting companies greater assets and size to deliver on larger initiatives so Linux can touch more people. One deficiency of Linux is that it’s difficult to find and install new software. To address this shortcoming, Linspire built CNR Technology which I’m more excited about than ever. 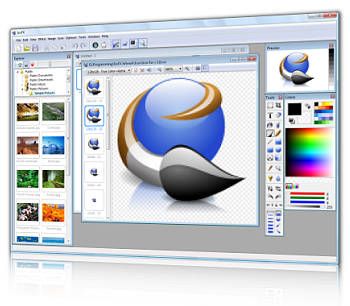 CNR is a marketplace where users can browse for software programs (free and commercial), download and install with a single mouse click. More than 10,000,000 Linux software programs have been installed via CNR which now works for Ubuntu, Debian and other Linux versions. New systems like eee PC need CNR which is why Linspire marrying Xandros makes sense. I’m proud of what we tried to accomplish at Linspire. We spent considerable money and supported important initiatives like Mozilla, KDE, Wineconf, Gaim (Pidgin), Nvu, Debian and more. Although there’s a loyal Linspire and Freespire audience there’s no denying we did not succeed in bringing Linux to the masses as we intended to do. Even with Ubuntu’s success, Linux on the desktop is still the domain of software engineers and technical people. Over the last 2 years, I have come to know Xandros CEO Andreas Typaldos. He’s an impressive businessman with considerable success. Most impressively he came from the humblest of beginnings as a Greek immigrant unable to speak the language. Now he’s running Xandros. He’s shared with me his grand plan for Xandros — it’s ambitious and goes far beyond the operating system to applications and management. I’m confident that Andy will lead Xandros to success and that is why the sale of Linspire makes sense. I believe Xandros will maximize the value of Linspire’s brand, engineers and technology such as CNR.